The Profit Season 2 Premiere Announced. Woo-hoo!!! 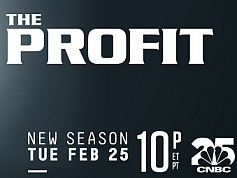 Home The Profit The Profit Season 2 Premiere Announced. Woo-hoo!!! I am happy to announce that the profit new season 2 with Marcus Lemonis will premiere this month :). February 25th, 2014 is the date to mark down on your calender. The show airs on CNBC Prime at at 10p ET/PT US time. Check your local listings for your time zone. Here is the super trailer. HOT!!! Surely, this is going to be fun. Don’t miss it. Get Your Business On The Profit Show. Welcome to the Profit with Marcus Lemonis fan site. Cant wait. Hope Marcus makes more successful deals. I sure hope Marcus sees my request(plead) for help, i believe in myself and my product but most of all my Mom believes in me and i don’t want to let her down! I so desperatly want to get my name back in the community before it’s to late for her to see me being successful again.My martial arts facility has been around the NASHUA NEW HAMPSHIRE area for over 25yrs. The email address on your contact page doesn’t work. Thanks for letting us know. It has been updated. I am obsessed with this show! Can’t wait for season 2. This is one of the only shows that is in touch with the reality of owning a business. Marcus truly makes the show. People, Product and Profit! This really is a good show. I’ve watched both season 1 and 2 and I have to say that Marcus has really shown me a few tips that I can use in my own small business. I like his simple concept of people, product, process. I also appreciate that he is old school with some of his business ethics. I’m really hoping that he will be on for a season 3! I thought about submitting my small business, for the show, but I don’t know if I could handle it. Awesome show though! any update regarding when is he going to go on a new business adventure? I interviewed Marcus and I can say that he has a real passion for helping others and making businesses successful. For him, it’s more than just business plans, numbers, and formulas. What Marcus really enjoys is finding out what makes people tick, what motivates them, and how they can reinvent themselves as well as their business. It may seem weird, but I’m wondering is there any plans for CNBC to release DVD’s of these shows? Any insight you would have would be appreciated, so I’m putting it out to the interwebs. Ok, now how about a season 3 . I had an opportunity to watch two episodes of the PROFIT and was very excited with this show. This show deals with helping a large portion of American small businesses get back on track and actually turn a profit. There was one episode ‘Jacob Maarse’ Flowers; Season 1 episode 2, that I believe is the true reason this show should continue and not only just to continue but should be moved to a prime time slot. For example; The Manager of Jacob Maarse Florist never once took that company seriously and lacked any type of leadership as well as making his General Manager appear as if she wasn’t living up to her task when in fact she was meeting her obligations although in fact she was doing his job for him. I like the show very much and I hope they keep up the good work! next post: Get Your Business On The Profit Show.